Never be sympathetic with a person whose situation causes you to conclude that God is dealing harshly with him. God can be more tender than we can conceive, and every once in a while He gives us the opportunity to deal firmly with someone so that He may be viewed as the tender One. If a person cannot go to God, it is because he has something secret which he does not intend to give up— he may admit his sin, but would no more give up that thing than he could fly under his own power. It is impossible to deal sympathetically with people like that. We must reach down deep in their lives to the root of the problem, which will cause hostility and resentment toward the message. People want the blessing of God, but they can’t stand something that pierces right through to the heart of the matter. If you are sensitive to God’s way, your message as His servant will be merciless and insistent, cutting to the very root. Otherwise, there will be no healing. We must drive the message home so forcefully that a person cannot possibly hide, but must apply its truth. Deal with people where they are, until they begin to realize their true need. Then hold high the standard of Jesus for their lives. Their response may be, “We can never be that.” Then drive it home with, “Jesus Christ says you must.” “But how can we be?” “You can’t, unless you have a new Spirit” (see Luke 11:13). There must be a sense of need created before your message is of any use. Thousands of people in this world profess to be happy without God. But if we could be truly happy and moral without Jesus, then why did He come? He came because that kind of happiness and peace is only superficial. 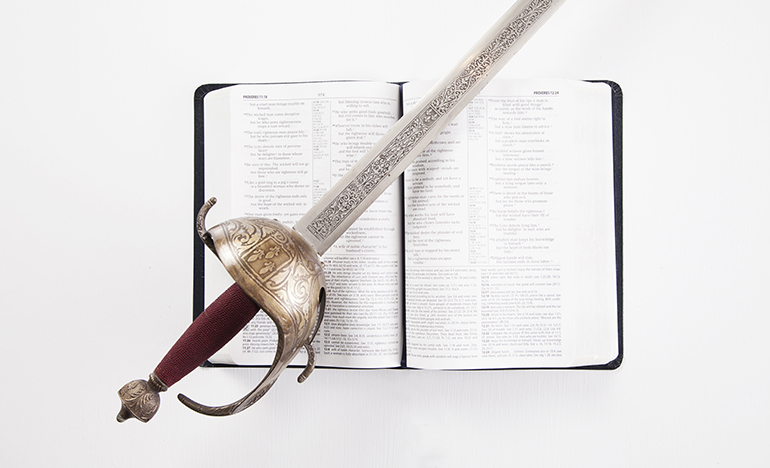 Jesus Christ came to “bring…a sword” through every kind of peace that is not based on a personal relationship with Himself.